It's spring and my winter hobby freeze is beginning to thaw. Mainly I just had nothing worth blogging or things stalled half way through. This is where this fellow stalled. 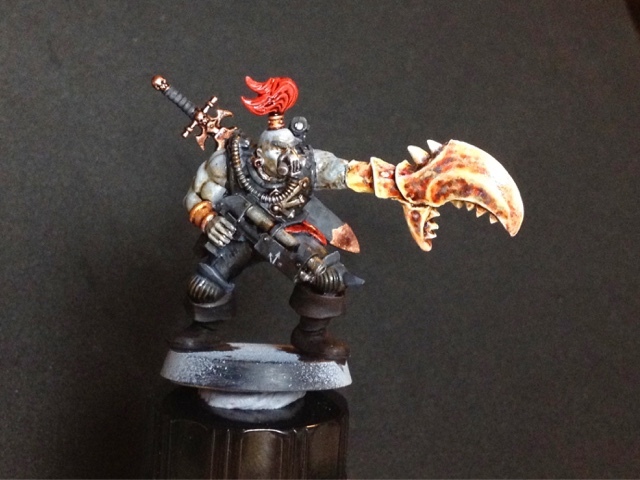 I am not happy with the claw and he needs a 32mm base. I've put him aside for now. 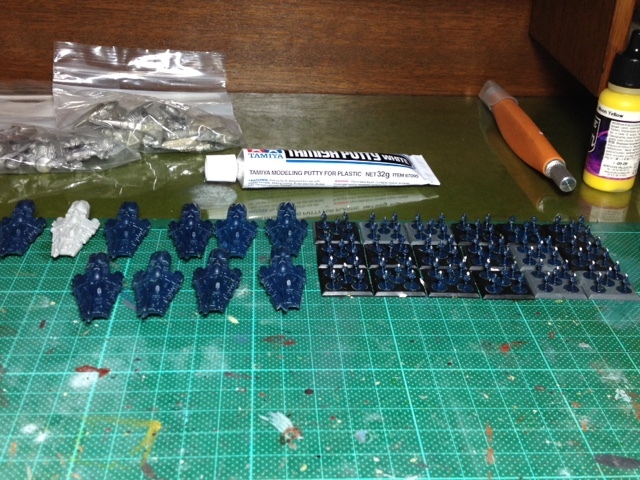 Next, I began work on an Epic Eldar army, with the all but finished Blood Angels force, I hope to play some Space Marine Second Edition with. A company of Falcons and one of Guardians. 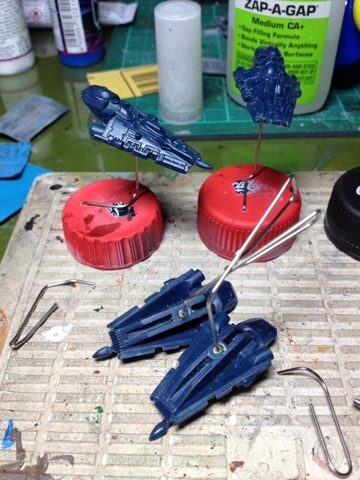 I've pinned the grav-tanks so that they look like they are flying once fixed to bases. 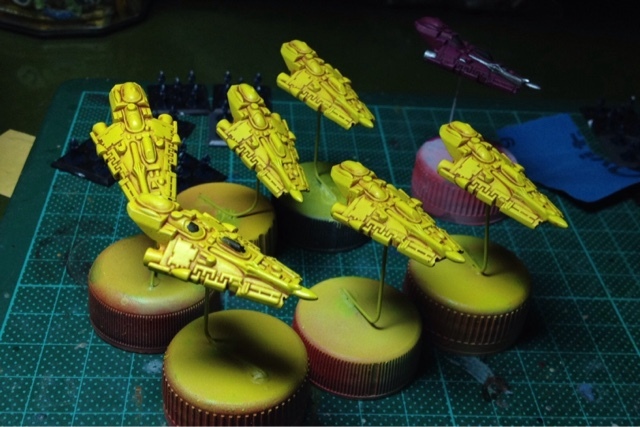 I air brushed on a coat of yellow and then gloss. 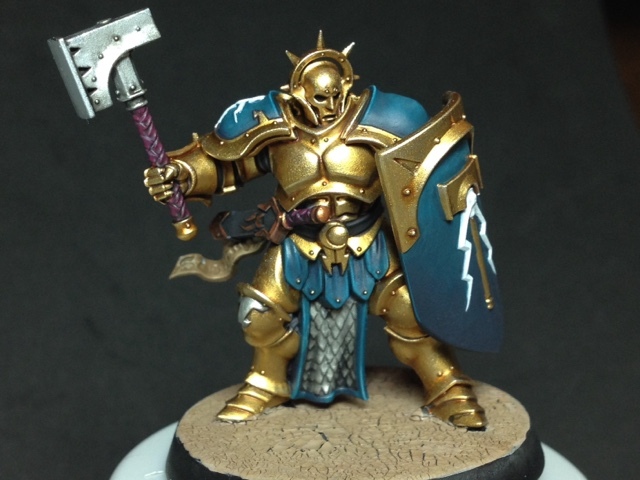 Goldie here was the only model that I managed to paint since the last post. 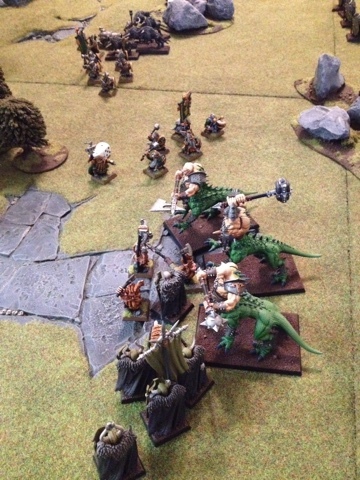 Age of Sigmar has certainly made one hell of noise in our quiet hobby world. So much hate poured onto the Internet. It's been quite extrodanary and, if I'm honest, quite off putting. On more than one occasion I've thought about going on a long, long online holiday and leaving all the anger and stupidity behind. The up shot of this is that AoS fits our little group very well. We've been playing it and enjoying it. After three games I'm starting to see it as a subtle little game that has given us the freedom to do whatever we want with hobby and models. It's also brought all sorts of half finished projects out of cupboards and sparked many more future plans. All great things in my mind! 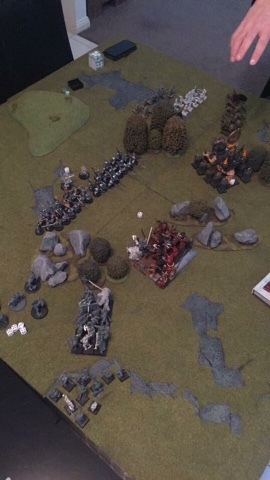 My forces of chaos fighting my dwarfs in our first game. Lesson: synergies are king! 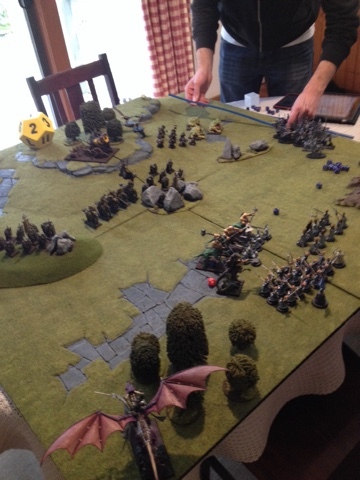 Warriors of Chaos v a loose coalition of Aelfs, Free Men and Stormcast. 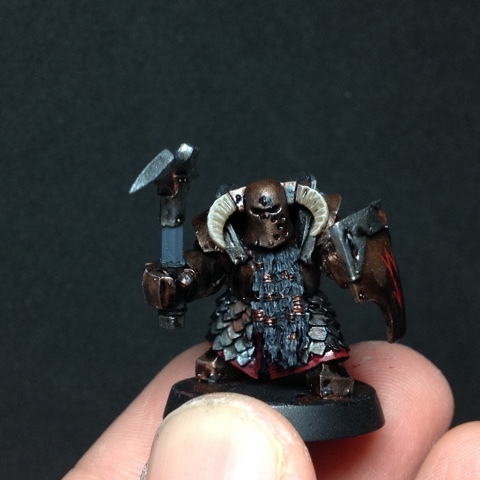 Lessons: Chaos Chosen are mighty. Synergies are the king of kings. 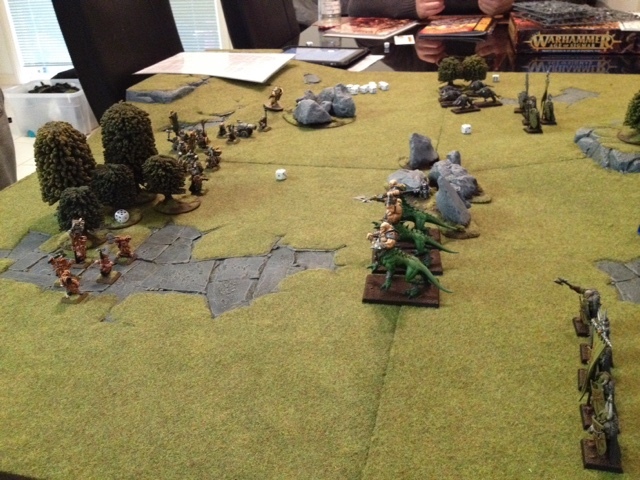 Warriors of chaos with chaos dwarf allies v Aelfs. Lesson: princes on dragons are crazy good and should be targeted with anything that deals out mortal wounds ASAP. Numbers do eventually show in combat. 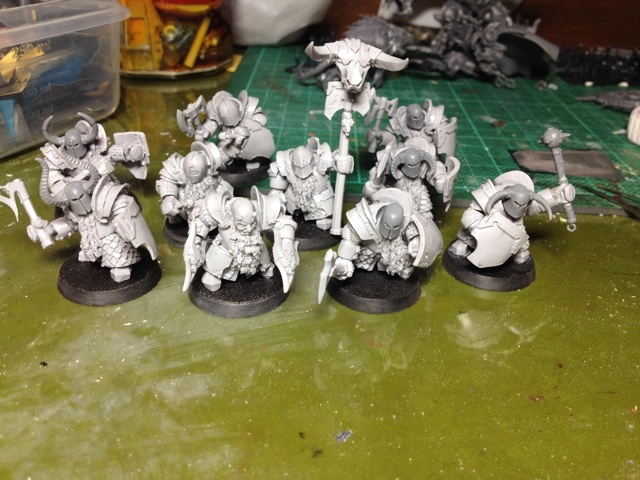 All this gaming led to me putting together the khorne half of the new starter set. It was a few weeks of work during the darkest days of winter. Trulely some fantastic models! I've made good progress on these evil little bastards and will post some more WIP shots as I go. 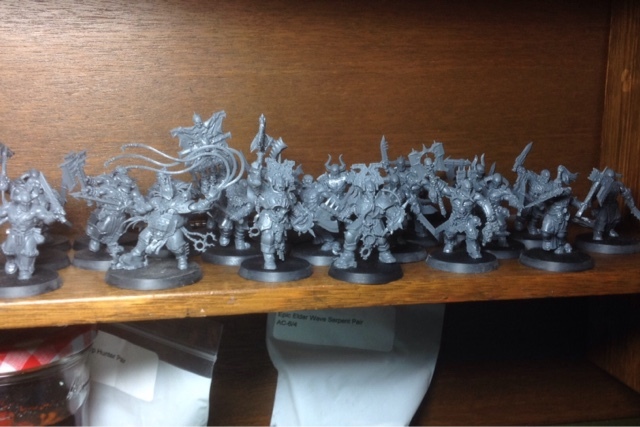 I'm also thinking about re-basing some of my chaos army. Round bases just look better. I don't know why but they do! It'll be a painful job so I'm putting it off. That's it. Hopefully spring will be more fruitful hobby-wise than winter! 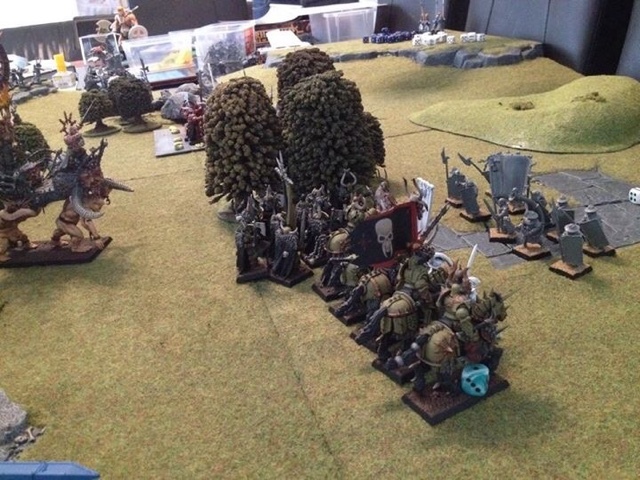 Wow those Chaos Dwarfs look great! I knew that cult leader would really start coming together once the painting started. Can't wait to see him finished up and bossing around the underlings. Cheers. It's always the way though. 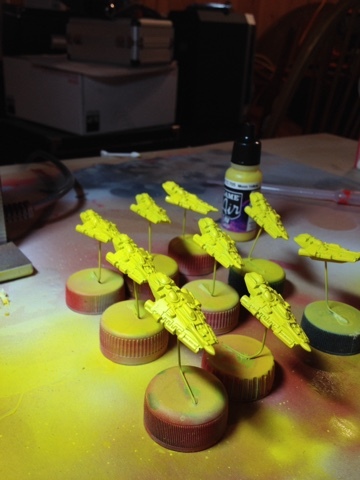 You wonder if a conversion is going to work until you undercoat it. the biggest problem now is how to paint the claw. I'll post pictures once it is done.